During the recent EuroMaidan protests, the website of Radio Free Europe/Radio Liberty was subjected to a Distributed Denial of Service (DDoS) attack, in which a large number of hijacked computers simultaneously retrieve large amounts of data from a web site, thereby attempting to crash the server and prevent legitimate users from accessing it. In many ways, this DDoS attack is an eerie echo of the jamming of radio signals that Radio Liberty and other Cold War-era broadcasters faced half-a-century ago. In the 1950s and '60s, the US waged a propaganda war based on providing news that was being censored by the Soviet government, information on cultural trends in the West, and a Western perspective on US, Soviet, and world events. This was done directly through the Voice of America based in Washington DC, or (using covert funding) through Radio Free Europe and Radio Liberty based in Munich, West Germany. Although the Soviet regime attempted to prevent the reception of these broadcasts by transmitting noise on the same frequencies, this jamming (like the current DDoS) was ultimately not very effective. Several prominent Ukrainian post-WWII refugees played an important role in the writing and broadcast of these programs. 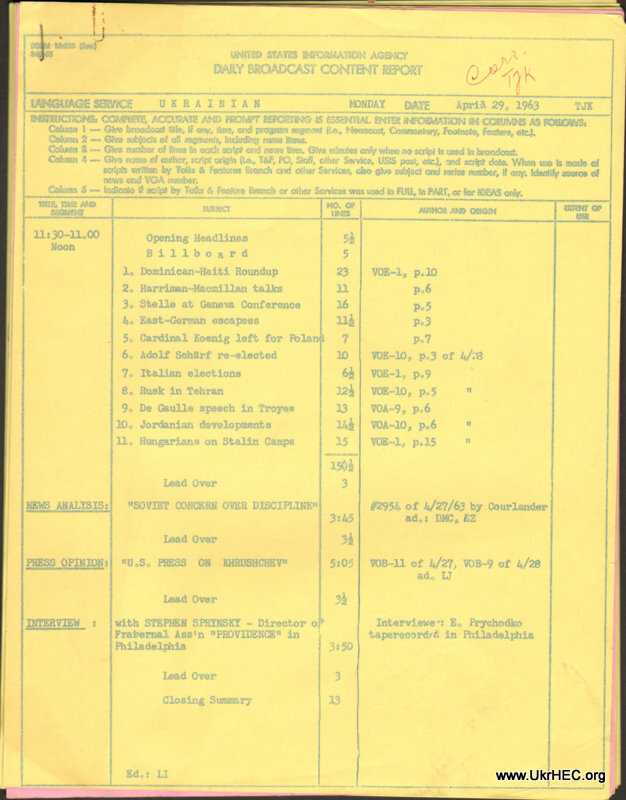 Our archival collections include a substantial number of radio scripts from this period, both from the Voice of America and Radio Liberty. Many of the Voice of America scripts were actually used in the production of the broadcasts, as they have been marked in pencil with symbols to indicate accents, inflections, and pauses. A collection of Radio Liberty scripts has been processed and is accessible to researchers.